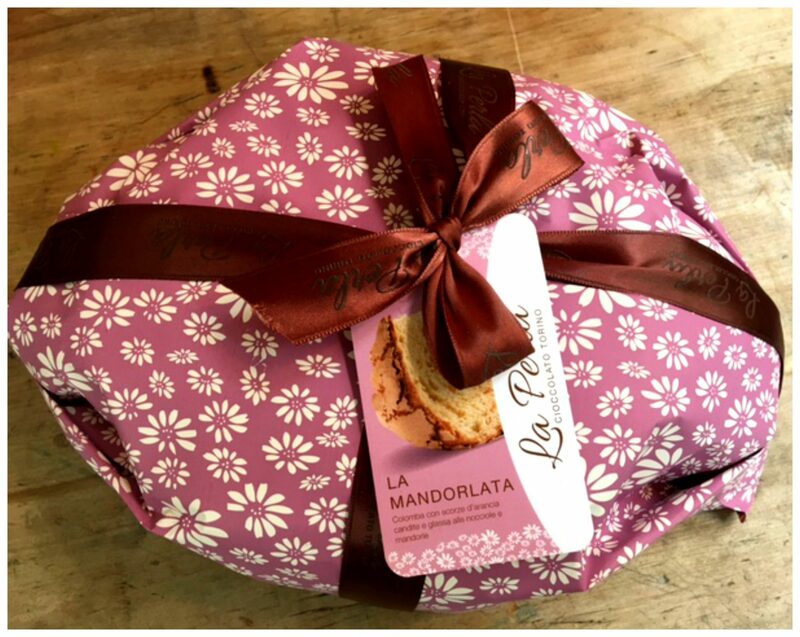 Colomba Pasquale (Easter Dove) is a soft, sweet, traditional Italian Easter cake similar to panettone – only better, some say. It was a Milanese baker Angelo Motta, who popularised panettone at the beginning of the 20th century and created the Colomba Pasquale. Instead of the dome or cupola-shape of the traditional Christmas panettone he turned it into a dove of peace for Easter. This is the authentic Colomba cake recipe from Flavours Italian chefs. Buona Pasqua! Place the yeast in a large bowl, add 50 ml of lukewarm milk and 100g flour (this is the base dough and it is called lievitino). Knead the dough “lievitino”, place it covered by cling film for 30 minutes in a warm place. Take the leavened dough, mix it with 80 ml of lukewarm milk, 100 g flour, set back to prove for 30 minutes more. Add 150 g of flour, 80 g of sugar and 50 ml of lukewarm milk to the dough. Knead for 10/15 minutes, add 80 g of softened butter slowly. Form the dough into a call, cover and place in a bowl. Let it prove for a further 2 hours. Take the dough, add 5g of salt, 100g sugar, the peel of 1 lemon and orange, the vanilla and eggs. Add 170g of softened butter. Knead until the dough is smooth and elastic. Add the candied fruit, roll into a ball. Leave to prove for another hour, after brushing it with melted butter. Place the covered dough into the fridge for 12 hours. Take the dough, knead for a few minutes, and place it in the dove shaped mould. Leave there for 3 hours for a final rise. For the icing: beat the egg whites with the caster sugar and the almond flour. Brush the mixture on the Colomba and top it with unpeeled toasted almonds and sugar crystals. Bake the colomba for 50 minutes in a preheated oven at 170 C (338 F). Let it cool down and then serve.